Thanks for looking. Please check back for replies to all your questions and comments. Your responses are what make doing these postings fun. 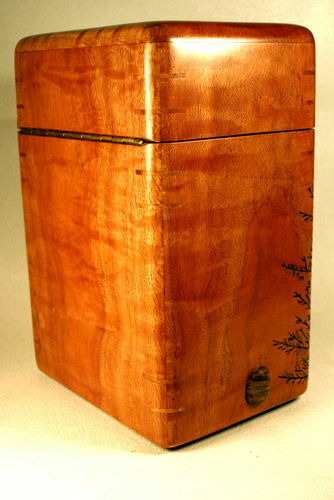 Pictured is a White Oak urn (12” H x 8” W x 6” D ) with a hinged lid and 6 splines in each corner. The corner splines are made of the same oak board so they will add strength to the corner joints, but not distract from the carved-in designs. The rocks and the maple cross are all inset deeply into the 5/8” sides. My friend Bob is a carver, painter, and a man of supreme patience. The trees carved on the corners are very detailed. After Bob carved the shallow branches, he then filled in each one with green color using a fine Sharpie. Bob did the design work on the trees, cross, words, and stones. All were design elements requested by the family of the deceased. My job was to build and finish the urn. and make sure the plastic box with the cremains would fit inside. (For more tips about building urns click here.) 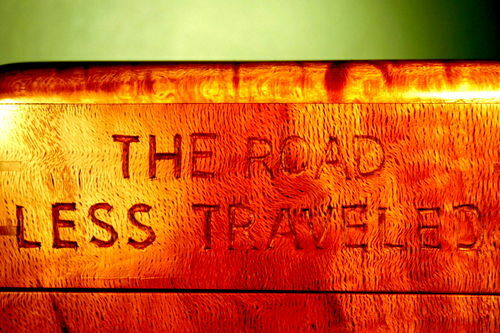 The family also wanted to have some words from Robert Frost’s famous poem, “The Road Not Taken.” Click here to see the whole poem. This poem is about the choices we all must make as we go through life. The poem’s narrator says he has chosen to travel the less popular paths or those roads that fewer people would choose to take. 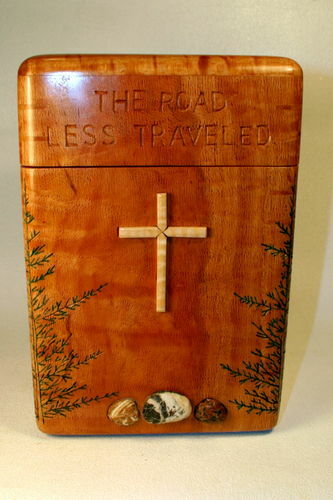 The words, “The Road Less Traveled” were also requested by the family, and Bob added those to the lid. It is difficult to include this many disparent elements in a small box, but Bob did a tasteful job of meeting the challenge of what the family wanted. 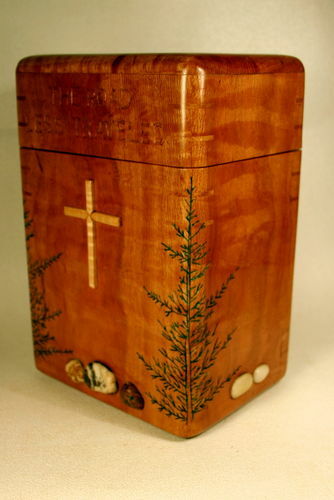 Story: Bob’s friend died and the family asked Bob to create an urn to hold the friend’s cremains. Bob asked me to help him make make the urn. 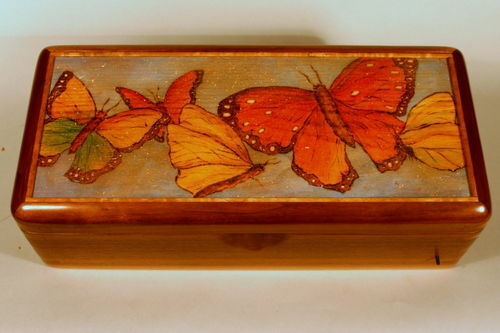 I had a box with a butterfly on top that needed to be painted. I asked him to help me paint the butterfly. (I’ll post that box later.) So we traded favors. I made an urn for Bob, and he painted a butterfly for me. It solved a problem. Nether of us would have been comfortable charging the other in this case. Trading favors was a great solution. I have always liked the idea that two of us working together can create something that neither of us could make if we worked just by ourselves. Very nice collaboration. I am fortunate enough to have a wife who helps with those requirements. 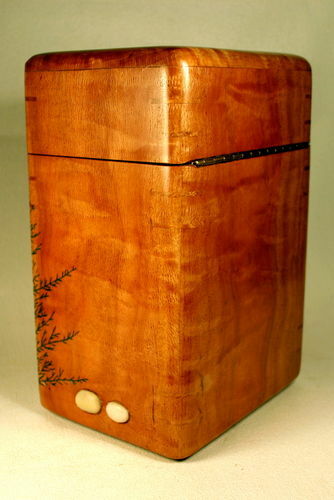 That being said, I am getting more requests for urns, but I just don’t enjoy making them. I try to gracefully turn those projects down. I haven’t had a close personal request to date. Not sure what I will do when and if that day comes. I feel sure the family will be pleased. Very nice work. A collaboation like this make something worthy of the purpose. Well done! Nicely done Al, great collaboration and it’s still your design. Bob, I avoid urn requests too, but there are some you just have to do. 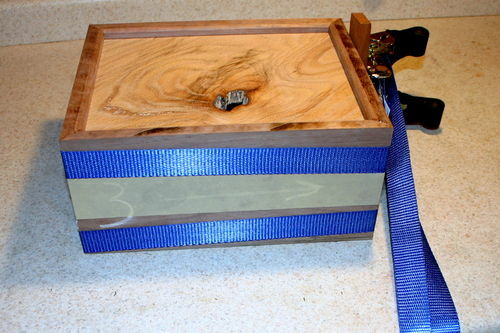 This box was a challenge because the grain runs vertically. Usually my boxes have grain that runs horizontally. I liked your watch boxes. Jim, how nice to hear from you again. Hope you are having a beautiful summer in sunny Italy. 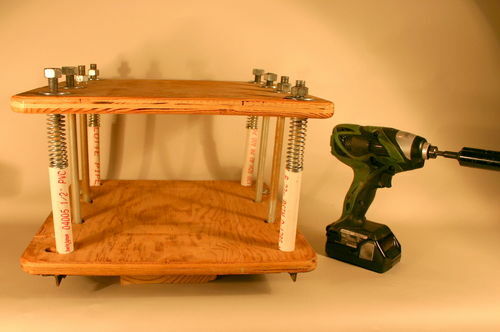 I loved the workbench you made for your five-year-old. It is great. It really is fun to work with Bob. He is quite a carver and fun to spend time with. and make some $5 band clamps like this. That being said, you certainly have an impressive clamp collection. Always nice to hear from you again. Keep boxing and keep posting. Nice work, very unique, I can see a top three coming. Great job Al. Collaboration is a wonderful way of saying to another craftsman, I respect your talent and skill enough to entrust you with the task. Both parties end up feeling good about the end result. Topamax, it is nice to hear from you again. I haven’t seen a “Grandpa, I need a…” project in quite a while. Are you doing OK? I appreciate your kind words. I hadn’t thought much about it, but you are right. This is a pretty unique creation. Brit, what wonderful thoughts from you, thanks. I have several craftsmen I have worked with through the years. We have all combined talents to make different kinds of boxes. They do painting, carving, scrolling, burning, veneering, sewing, weaving, ceramics, metal work, and stained glass. It has always been fun, and they have never let me down on their part of the project. Of course you are right, there is an element of trust and respect involved in collaboration. Thanks for reminding me about that. Al, this one is awesome. When you work together with another artist, you get the best of both involved. Many times I’ll make a project and get my Son (who is not a wood worker) to apply his painting skills. Great job. The urn is beautiful, you and Bob together made it what it is; perfect in every way. And when you mentioned butterfly I knew we would see more beautiful work! The butterflies are amazing! Wow! 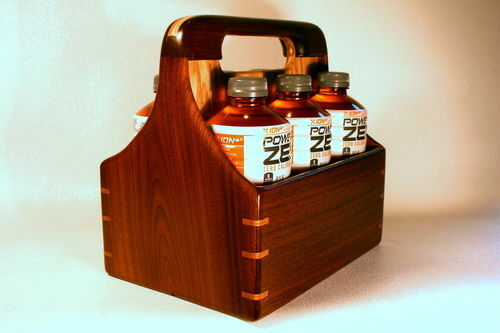 Al, this is a beautiful box and a wonderful eye catcher. It has a lot of great character, spectacular details, and fine craftsmanship. I love this box and it’s one of my favorites. Bob, the carving and artwork is beautiful and adds a lot to this piece. Jeff, thanks. I think you are right working with others is a great way to bring out the best in others and ourselves. I liked your beer tote post. The walnut in the sides is spectacular. The design is classic and the “Bottle Hammer” is funny. Your son did a great job on the photos. Nice story. Keep boxing and keep posting. Just by way of sharing ideas this is a carrier I posted has similar lines, but fewer pegs. Tony, thanks for the kind words. Bob certainly did a fine job on his part of this project. I liked the drawer unit and workbench you posted. Lovely work. Shop furniture and games is an interesting combination. Thanks for sharing that. Charles, thanks for saying such nice things about the project. I liked the cabinet you posted. Your Tormac looks quite content atop its new perch. beautiful work cant really say more than whats been said,having done a few myself i know there isnt much enjoyment other than knowing your helping someone get through a painful period in life.you did a gorgeous job and the tree engraving is incredible.you work well together. This is a beautiful box! It’s definitely a Boxguy box, but with Bob’s work, it’s really something! I’ll bet the family really appreciates it, and all the compassion and care you guys put into it. A unique and beautiful gesture from you guys. Beautiful work both in craftsmanship and with others. Truly you are an old soul. Very unique urn, great workmanship.